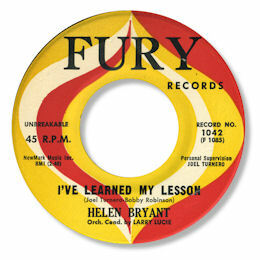 This would seem to be the only release by Helen Bryant but I've Learned My Lesson is a first class piece of deep soul. Or is it an R & B ballad? Whatever pigeon hole you want to put it on Helen's vocal performance is absoutely wonderful - swooping and soaring all around the melody. Her big brassy tone is right out of the blues tradition but she is also full of gospel tricks and flourishes - the best combination of course. It's hardly worth mentioning the rhythm section so overpowering is the vocal but there are some nice baritone sax touches and a good girl chorus. Larry Lucie's and Joel Tunnero's understated production shouldn't be missed either. But the honours go to Ms Bryant - does anybody know why she never had any more singles released? UPDATE ~ My friend Greg Burgess the Great Researcher has written to say this about Helen - "Helen Bryant was part of prof Herman Stevens Stevens Singers a gospel group operating around New York-Philadelphia-New Jersey from the early 1950s to the early 1970s." I'm always grateful to Greg for his efforts for this website. Check out the wonderful pic of Helen and Evelyn Archie tearing it up - courtesy of Mike Cassidy. Simply wonderful! NEW UPDATE ~ Bob Stumpel writes to say that "Helen Bryant was also a Raelette for a short while. But she picked a good period, being part of the "Live In Concert" taping at the L.A. Shrine Auditorium in 1964." I'm grateful to Bob for the extra info. Thanks to Mike Finbow for the excellent suggestion.